Rats and mice are rodents that have many similarities, including the same number and type of teeth. In fact, their classification together in the superfamily Muroidea is based on the shape of their lower jaw. Animals that are related to rats and mice but have slightly different teeth are classified outside of the Muroidea superfamily. The dental formula is a simple method of describing how many teeth an animal has on both the top and bottom portion of the jaw. The first number indicates the teeth on one half of the top jaw, while the second number indicates the teeth on one half of the bottom jaw. 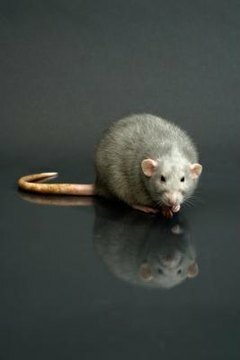 Rats and mice have the same dental formula: incisors 1/1, canine 0/0, premolars 0/1 and molars 3/3. Since the numbers are for only one side of the mouth, they should be doubled to determine the total number of teeth. This means that mice and rats have a total of 18 teeth, including four incisors at the front of the mouth, two premolars midway back on the bottom jaw and six molars at the back of the mouth. The incisors, or long front teeth, in rats have open roots, which means they continue to grow throughout the animal's life. A rat or mouse must gnaw or chew enough to wear down the incisors and keep them from becoming overgrown. Both animals can have serious problems if the incisors get too long. Crooked or misaligned teeth are often the cause of overgrown incisors, but a lack of proper chewing materials can also be to blame. Rats have dark yellow or orange-yellow incisors. Unlike humans, the yellow color is not an indication of poor dental health; it's caused by a pigment that contains iron and is usually present in greater amounts on the top teeth than the bottom. Mice also have this natural yellow pigment, but it's not as noticeable because their incisors are not as visible as those of a rat. Besides having larger bodies than mice, rats have much larger teeth. If you find objects that have been chewed, you can tell whether it was a rat or a mouse by the size of the tooth marks. Rats leave behind deep marks, usually about 1/8-inch long. Teeth marks made by mice look like tiny scratches on the surface. Their smaller teeth aren't capable of making the same gouges as heavy-duty rat teeth. Monophyodont refers to an animal that has only one set of teeth throughout his entire life. Humans and dogs, for example, are polyphyodont, which means they start out with a set of baby or temporary teeth and later grow permanent teeth. Both mice and rats are monophyodont and the teeth that come in when they are babies are the same teeth they will have as adults. Scott's MiracleGro: Do You Have Rats or Mice in the House? What Age Do Puppies Lose Their Baby Teeth? Can Snakes Grow Back Their Fangs?